Lubia Polo (Persian green bean rice) is a healthy and complete meal with amazing taste. A one pot meal so quick and easy to prepare. Packed with protein, fiber and complex carbohydrates. 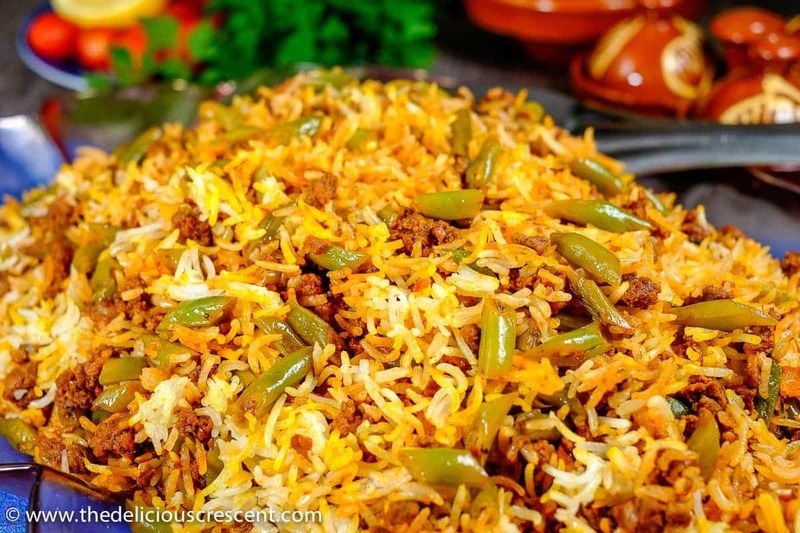 This Persian Lubia Polo is a popular comfort dish – a rice dish layered with green beans, spiced ground meat, tomatoes, herbs, lemon and infused with saffron. The ingredients and description may come across as pretty mundane to some. But it is absolutely worth a try and a recipe that is a keeper. Always reliable at busy times. Traditional Persian rice recipes involve the preparation of a rice crust at the bottom of the pan. 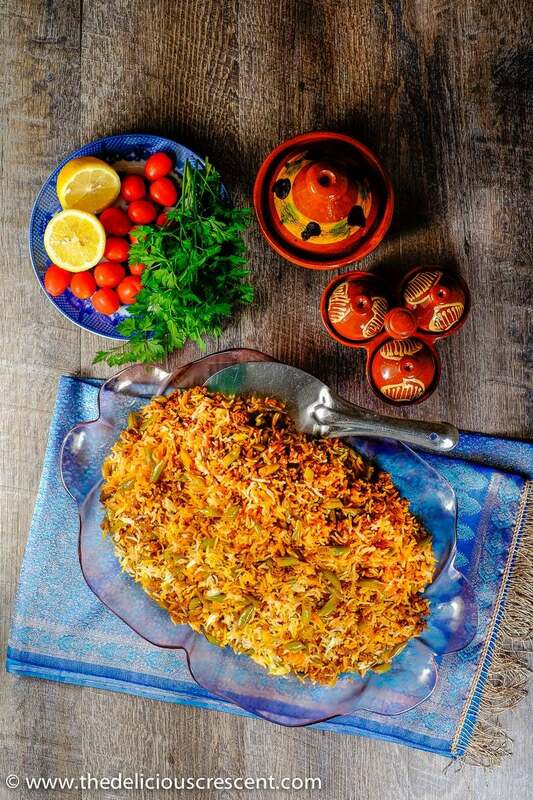 If you would like to try making that, check out my Tahchin-e Esfenaj (Saffron Yogurt Rice). This is a complete meal that includes slow digesting complex carbohydrates, good amount of protein, adequate fat and fiber. In this particular recipe I decided to sneak in some brown rice to add to the fiber that is already there from green beans. Plus, it also adds a good amount of antioxidants, vitamins and minerals. Traditional Lubia Polo recipes use whole tomatoes but here I have used tomato paste – a trick that I learned from my father in law. Green beans, a pod vegetable, are a rich source of cancer fighting chlorophyll. They also have a good amount of folic acid and vitamin K. Folic acid is essential for a healthy pregnancy and combating depression. And vitamin K plays an important role in bone health. Green beans are low in calories, high in fiber and nutrient dense – as they are a source of a variety of vitamins, minerals, phytochemicals with antioxidant and anti-inflammatory benefits. If you have a rice cooker, definitely try using that for making this recipe. It will simplify it so much and give you a more reliable result regardless of your experience with cooking long grain basmati rice. The recipe below offers several different ways to cook this dish – with or without brown rice and with or without rice cooker. The good thing is that you can easily use frozen beans and make it even more simpler. 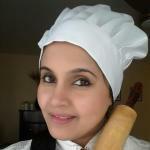 And do check out the notes section below to master Persian rice recipes. 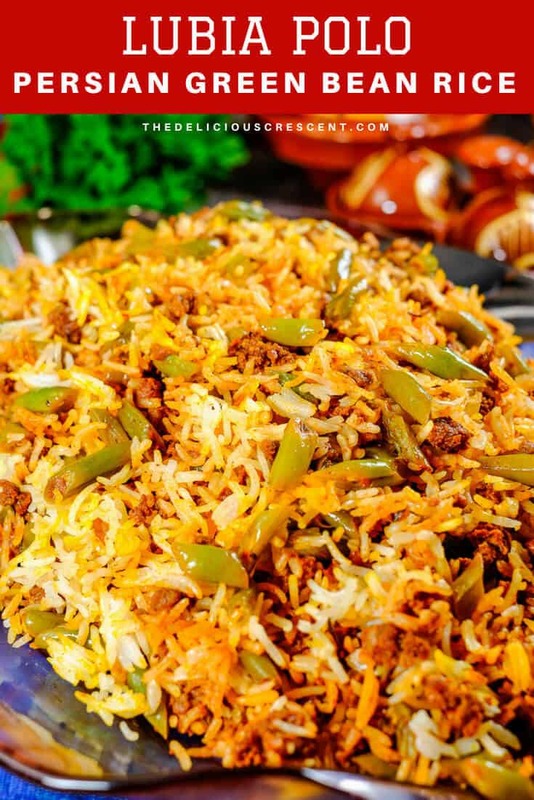 This easy appetizing wholesome Persian Lubia Polo recipe is a sure keeper. Try it once and you will be making it again and again. And it is freezer friendly too. 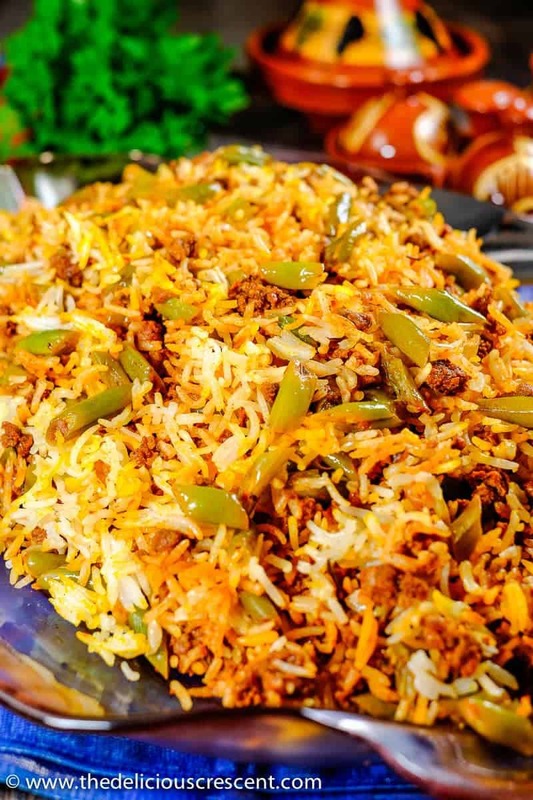 Persian Lubia Polo (green bean rice) is a complete meal with an amazing taste, so quick and easy to prepare, with good protein, fiber and complex carbohydrates. Bring 1 ⅓* cups of water to a rolling boil in a sauce pan. Add 1/8 teaspoon salt and 3/4 tablespoon olive oil. Then add 2/3 cup brown basmati rice, stir and bring it to a boil. Lower the heat and allow it to cook until all the water is absorbed for about 30 to 40 minutes. In a cooking pot, bring 4 cups of water and 3/4 tablespoon salt to a boil. Add the white basmati rice and let it boil at medium high heat for 5-6 minutes until the rice grains are soft. Make sure to stir the rice while it is cooking. Drain the rice well in a colander and set aside. Bring 6 cups of water and 1 tablespoon salt to a boil. Add the rice and allow it to boil at medium high heat for about 5 to 6 minutes until the rice grains are soft. Stir the rice in between. Drain the rice and set aside. If using a RICE COOKER, you may cook the rice with 3 cups water, 1/2 teaspoon salt and 3/4 tablespoon olive oil. Heat 1 ½ tablespoon olive oil at medium setting in a cooking pot. Add the chopped onions and sauté few minutes. Then add the grated garlic and continue to sauté until the onions are light golden brown. Add the ground lamb and sauté. Then add all the spices, dried herbs, remaining salt (advieh through lemon powder) and stir for 2 to 3 minutes. Add the green beans. Next add the tomato paste and mix it well. If the mixture is too thick, may add a tiny bit of water, cover and let it simmer until the beans are 3/4th done. It will continue to cook in the steaming process in the next steps. Make sure that the mixture is not too wet. Place the cooked rice with the sautéed meat/green bean mixture in several alternating layers in a heavy bottomed cooking pot. Sprinkle 3/4 tablespoon olive oil and saffron water all over. (Alternatively, you could also layer the rice with meat/green beans and steam it together in a RICE COOKER). Once the rice is ready, turn off the heat. Gently mix the layers of the Persian Green bean rice. Serve this Persian Lubia Polo with a yogurt salad such as Persian Yogurt Dip with Shallots or a green salad, pickles and/or pickled olives. Bring 4 cups water to a boil. Add 1/2 teaspoon salt and 1 ½ tablespoons olive oil. Add the brown rice first. Simmer for about 20 minutes. Then add the white basmati rice to the same pot. Let it all simmer till the grains are well done. Proceed with the remaining steps as above for the Persian Lubia Polo. But skip sprinkling the 3/4 tablespoon oil after layering the white/brown rice mixture with the sautéed meat/green bean mixture. I used 1 ½ times volume of water to cook the brown rice. But if you need double the volume then try that, as it can vary with the age of the rice. It is important to keep in mind the additional moisture from the other ingredients added to this Persian Green bean rice, such as the tomato paste, green beans and onions. Therefore, in the first step, the rice should be cooked in a way to yield a fluffy rice, but holds its shape well and is not too wet and delicate. If using both white and brown rice, then I prefer to cook both separately before layering with the meat/green beans, as I can control the cooking of the various grains optimally. Persian spice mix (Advieh) recipe is on the blog. Ready made advieh is available at Persian or middle eastern grocery stores or online. May use a middle eastern or Mediterranean mixed spice as a substitute. This recipe appeared as a guest post at Kitchen Flavors. Calories 291, Total Fat 8 g (Saturated Fat 2 g), Cholesterol 41 mg, Sodium 295* mg, Potassium 495 mg, Total Carbohydrate 37 g, Dietary Fiber 3 g, Sugars 3 g, Protein 17 g * The suggested amount of salt is just a guideline and may need to be adjusted. Check for any added salt in spice mixes and other ingredients and adjust. I made it with white rice and cooking pot (no rice cooker). This was the best I ever made! I also put potatoes at the bottom of the pot while steaming. The time recommended worked perfectly to give me awesome Tadigs! Thank you Andrea. It makes me so happy that you both liked it. Lubia polo is our favorite too and my go-to dish when I want to make something quick. I cook the rice first but making sure to not overcook the rice. See the directions for water to rice ratio above. Just when all the water is absorbed, I layer it with the cooked meat, beans etc. and then steam. No I don’t cook it all together in water. Thank you Mag :) I am going to make it again today! I have a bunch of green beans in the fridge so I’ve been looking for new ways to use them! This is perfect! Thanks Liz. That’s awesome. Enjoy!